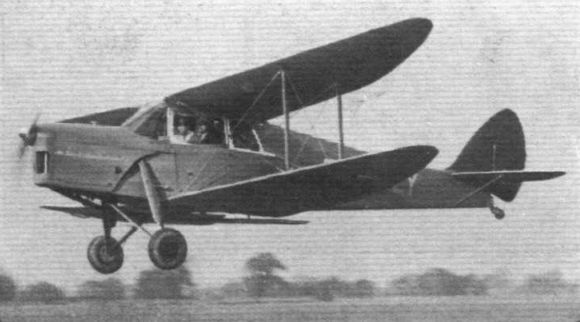 Curtiss Hawk Type III (U.S.A.). 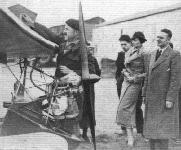 Bleriot sets off on his Channel flight. 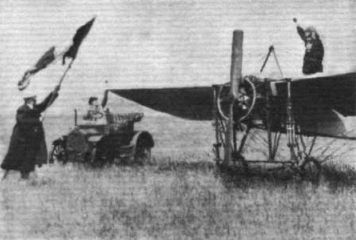 The machine is the still airworthy Bleriot which occasionally flies in France. 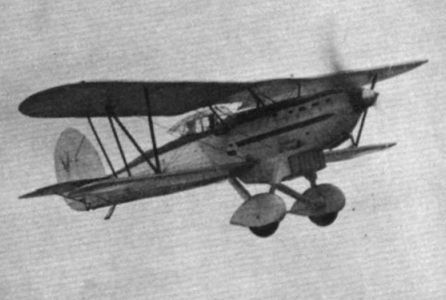 An apparently unavoidable departure from strict accuracy is that the Anzani engine is not a three-cylinder of the type used on the memorable flight. 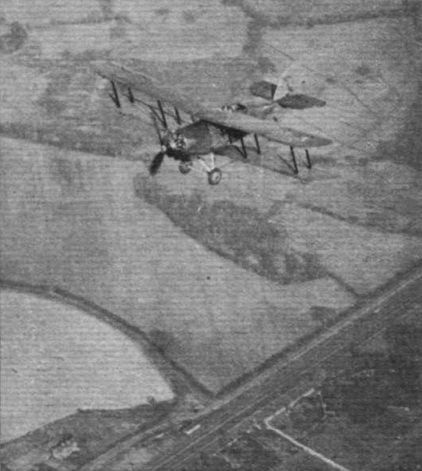 A VULTEE IN ENGLAND: The demonstration Vultee, which has been sent over here by Mr. Cord, being flown last Monday by Mr. Lee Smith at Hanworth, where it is being housed. 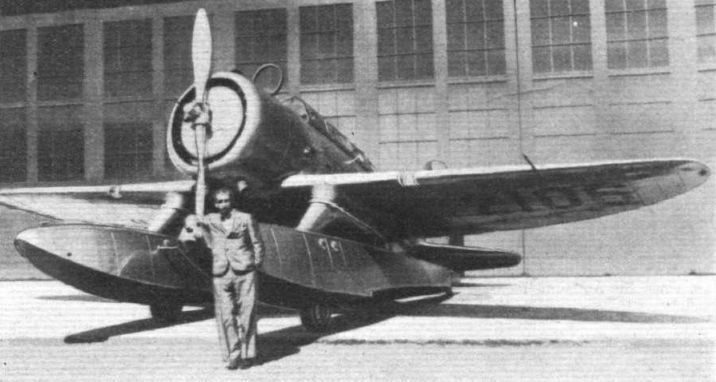 CYCLONIC: Mr. Lee Smith and the demonstration Vultee which, with a Wright Cyclone F. engine of 750 h.p., has a maximum speed of 235 m.p.h. 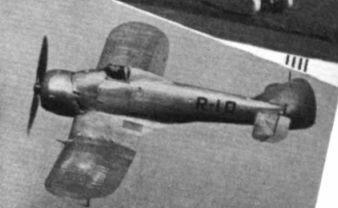 The Boeing P-26A (Wasp), a standard fighter of the U.S. Army Air Corps. 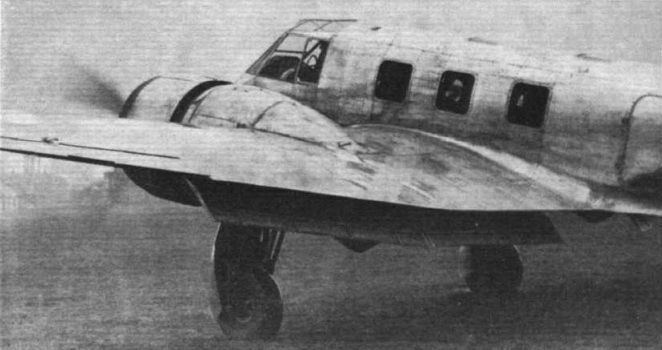 A Boeing P-12E with an experimental cockpit enclosure. 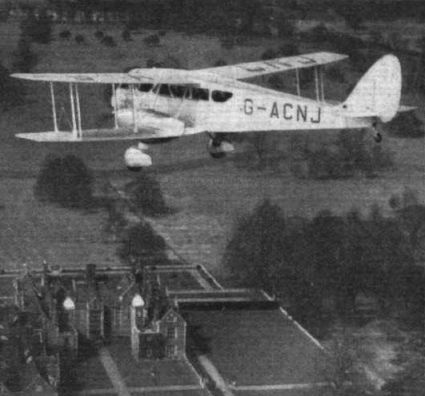 Daytime accommodation for 27 passengers will be provided in the Armstrong-Whitworth monoplane, and sleeping accommodation for 20. 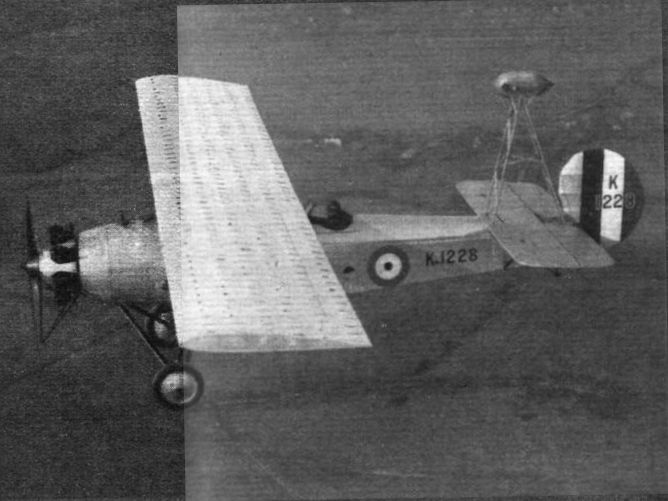 Studying air flow: The Parnall parasol monoplane used at the Royal Aircraft Establishment for filming, by an automatic camera, the movements of wool tufts on the wing. 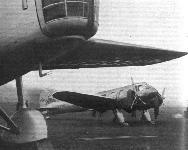 The actual air forces on the wing are also measured. 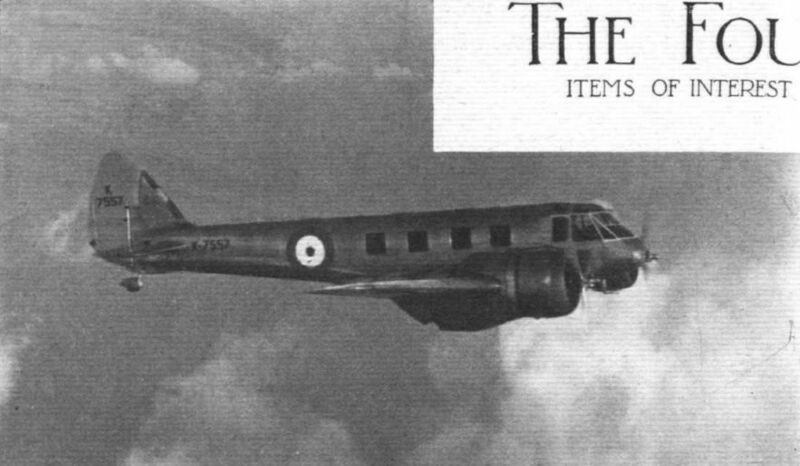 HIGH ASPECT RATIO is but one of the numerous outstanding features to be found in the new Vickers Wellesley medium bomber which has been ordered in quantity for the R.A.F. 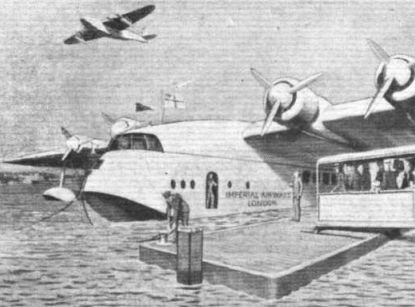 This machine made its first public appearance at the S.B.A.C. Display this year. 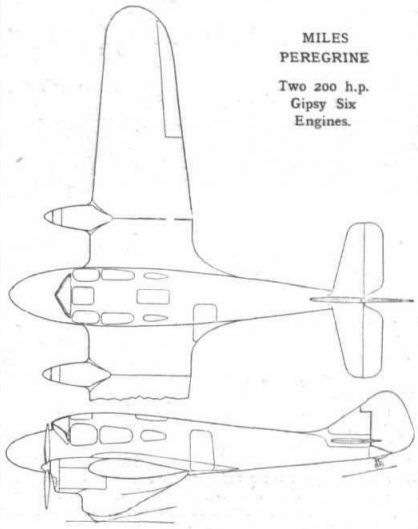 The engine in the prototype is a Bristol Pegasus III 690/750 h.p. 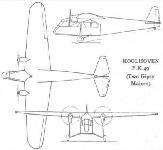 radial, but the production machines, it is now stated, will have a new type of Pegasus designated the Mk.XVIII. With full load the machine weighs about 10,000 lb. 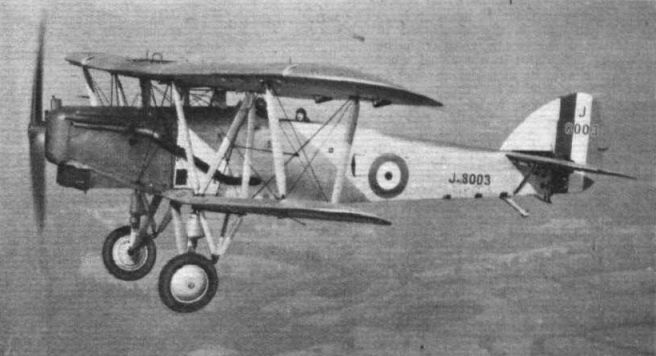 A Westland Wapiti with which experiments in vari-colour paints for camouflage purposes are carried out at the R.A.E. 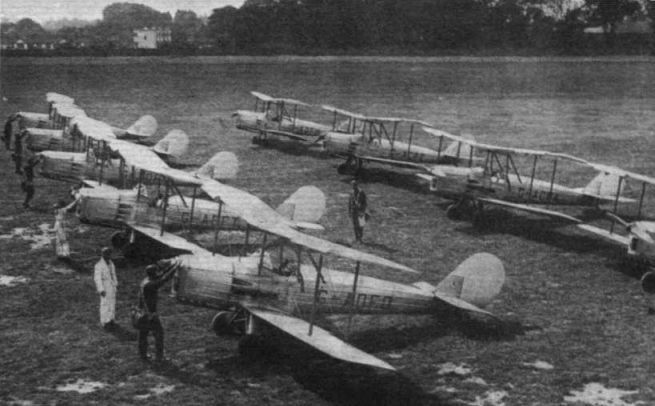 Farnborough. 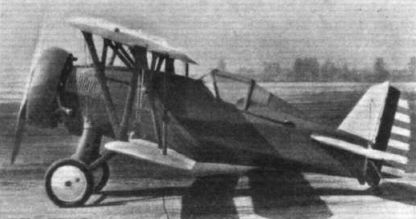 A MILITARY de HAVILLAND: The D.H. 89 (two 200 h.p. 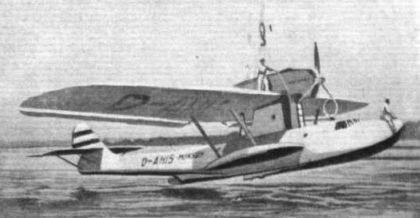 'Gipsy Six" engines) Coastal Reconnaissance machine. It has a fixed machine gun on the starboard side of the nose, and bombs are carried inside the fuselage. 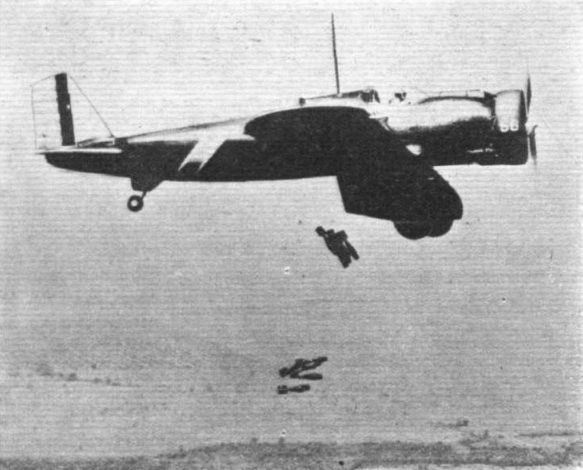 Note the shield for the rear gunner. Two 100 lb. bombs are carried inside the trap doors, here seen agape. 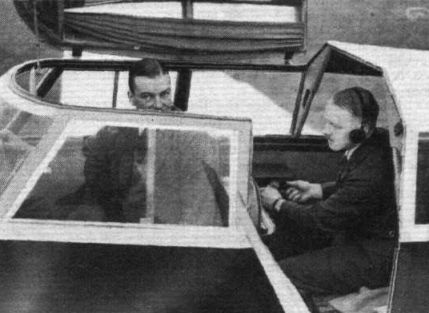 The pilot's fixed Vickers gun, on the starboard side of the nose, is also shown. 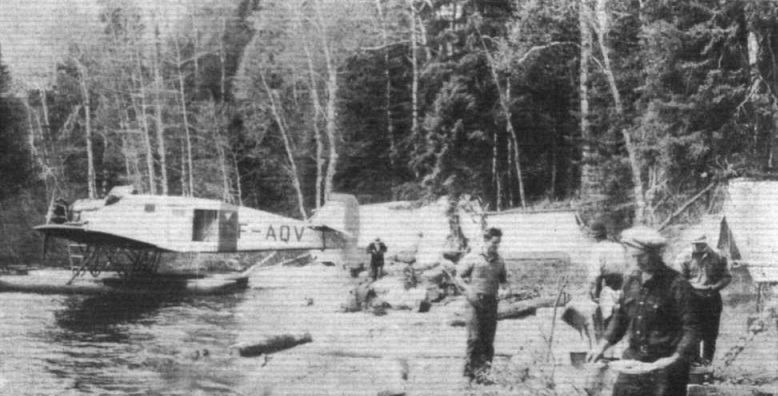 IN THE WILDS: Mining prospectors with their Junkers W.34 freighter in Canada. "HOMING" TO THE BALTIC: Last Saturday Messrs. H. C. Macphail and R. Ker (right) took off from Hanworth with a Jubilee Monospar fitted with R.T.E. visual homing equipment for a European tour. They will visit Denmark, Sweden, Norway, Lithuania, Latvia, Esthonia and Finland in the course of their tour. 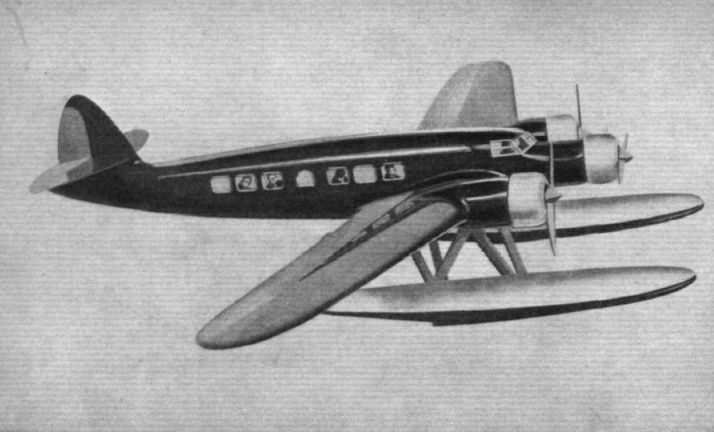 ECONOMICAL COMFORT: A new impression by a Flight photographer of the Heston Phoenix, which carries four passengers, a pilot and luggage at a cruising speed of 125 m.p.h. on 200 h.p. 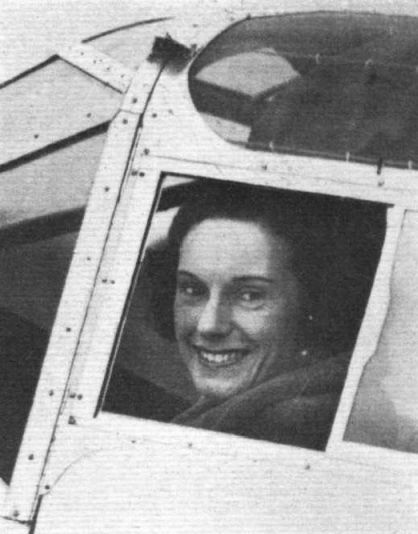 Miss Batten at the cabin window of the Gull. 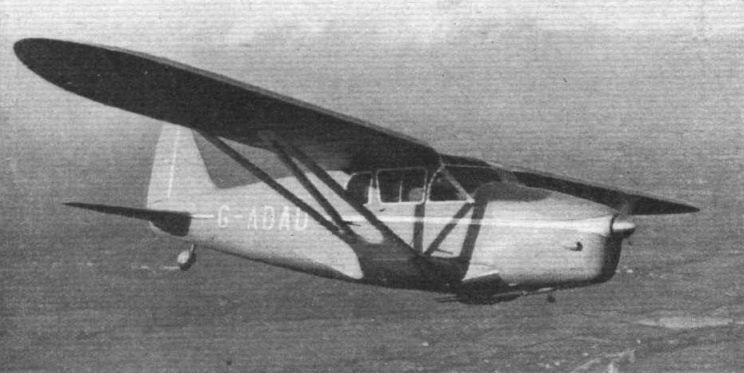 The Breda 64, as shown in this photograph, is fitted with a 600 h.p. 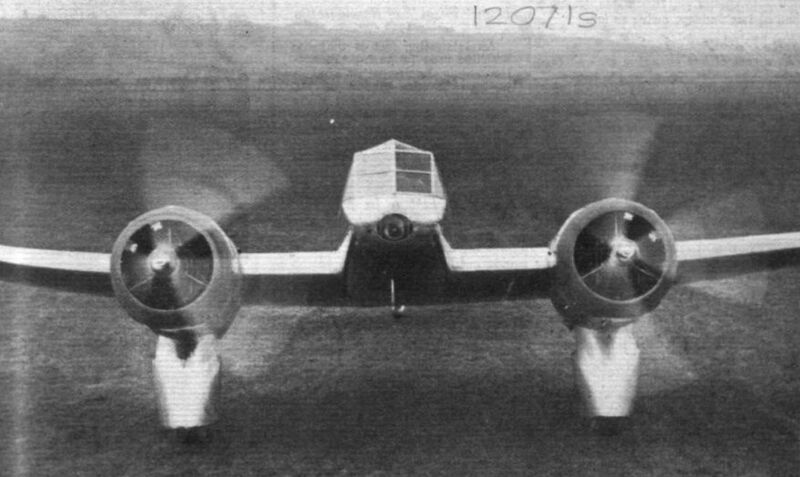 Piaggio Stella radial which gives a maximum speed of about 220 m.p.h. With a 900 h.p. engine it does 267 m.p.h. The pilot, it will be agreed, has an exceptionally good outlook. He will probably need it, as well as the "quintessence of aerial heroism". 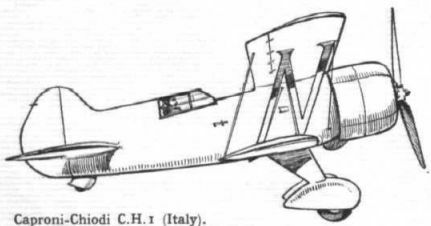 The wheels of the Italian Macchi C-94 twin-engined amphibian for Ala Littoria are carried, when raised, forward of the leading edge of the wing. ... PHILADELPHIA IN THE MORNING. 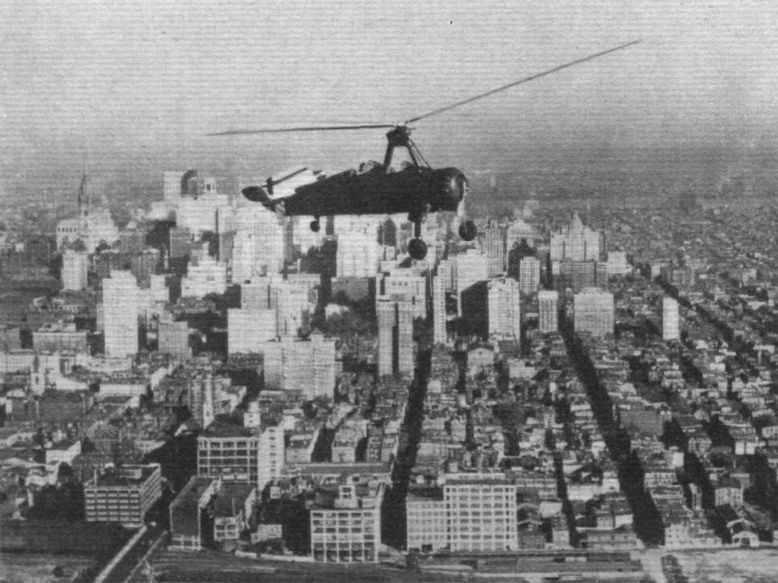 This is the latest type of Autogiro to be delivered to the U.S. Army Air Corps, it is a product of the Pitcairn factory and has a Wright Whirlwind engine of 420 h.p., which is reported to give a maximum speed approaching 150 m.p.h. 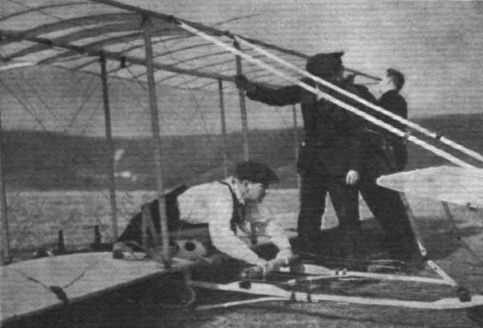 Here the machine is seen on a test flight prior to delivery at Wright Field, Dayton, Ohio, for official tests. 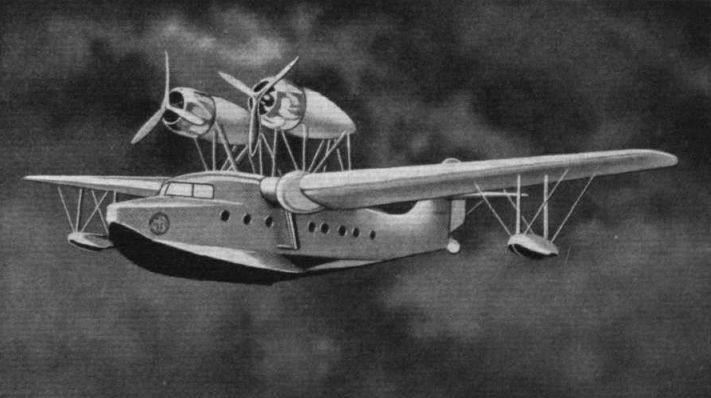 Styles from the States: The Sikorsky S-42 (four 750 h.p. Pratt and Whitney Hornets). The gross weight is 40,000 lb. 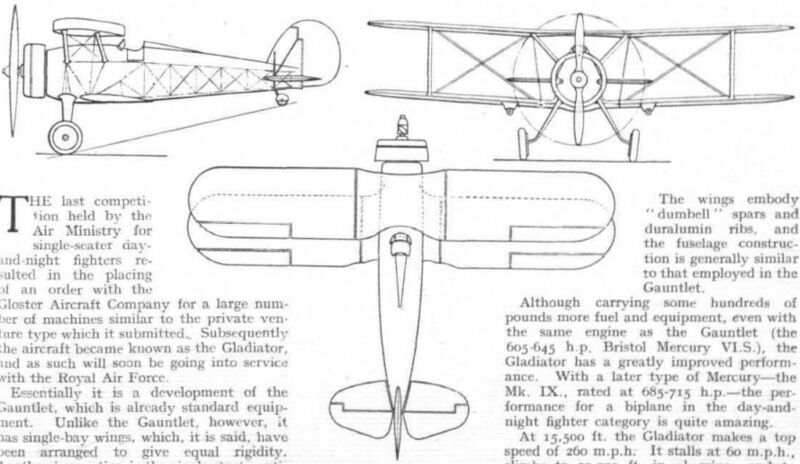 and maximum speed is 190 m.p.h. 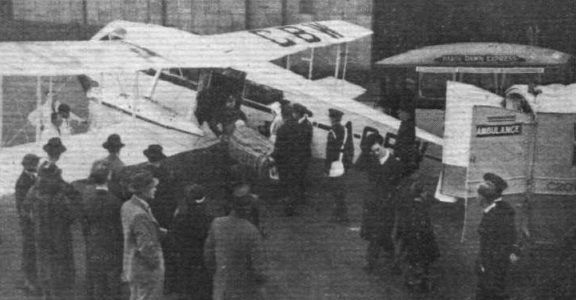 BEING ILL IN COMFORT: The Croydon demonstration of the D.H. Dragon which has been specially fitted up for permanent civil ambulance work by Air Dispatch Ltd.
A machine which has played a large part in unsubsidised air-line operation - the D.H.84, or Dragon, which is still in successful use all over the world. 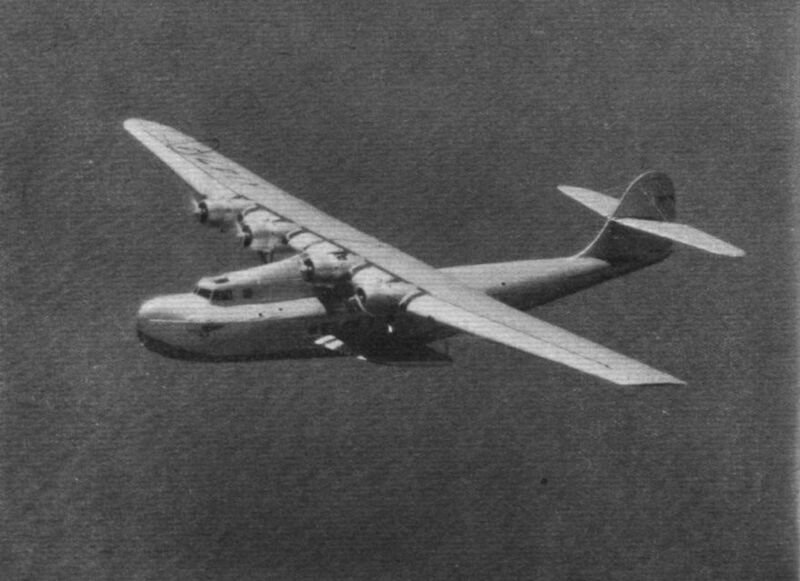 CHINA CLIPPER: This, the first of the big Martin boats to be delivered to Pan American Airways, has now been put on the experimental trans-Pacific service between Alameda (California) and the Philippines. 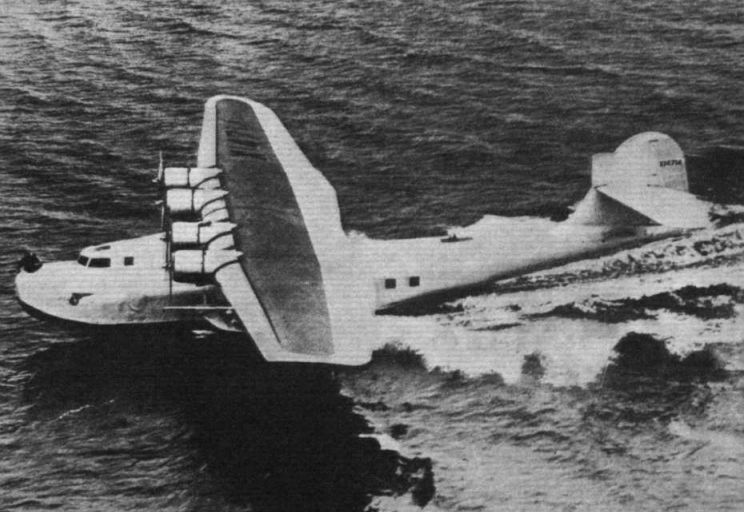 In its "daytime" layout, the China Clipper carries forty-three passengers and cruises at 157 m.p.h. for 3,000 miles. Styles from the States: The Martin 130 (four 800 h.p. 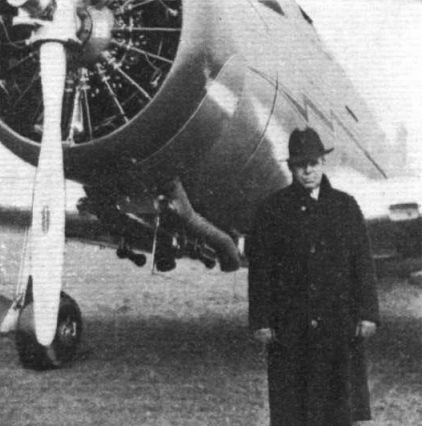 Pratt and Whitney Twin Wasps). The gross weight is 51,000 lb. and maximum speed is over 170 m.p.h. "Seawings" is the name given to the stabilising members of the Martin. Aerodynamically they give 50 per cent of the lift of that of an aerofoil of corresponding area. 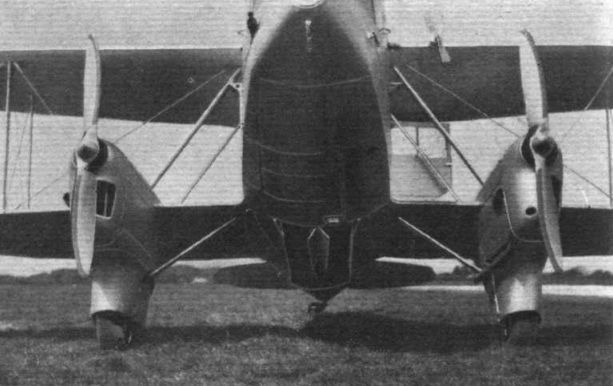 UNCONVENTIONAL: This unusual view of the Burnelli UB-14, taken by the Shell company, clearly shows the aerofoil section of the fuselage and the new tapered wings. 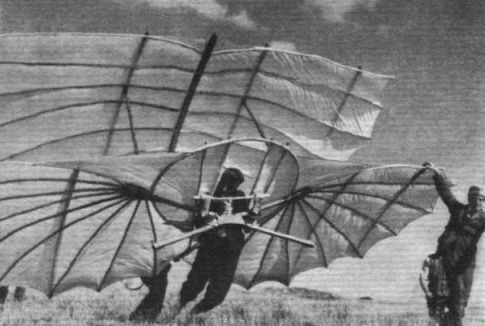 TOWARD THE FLYING WING. 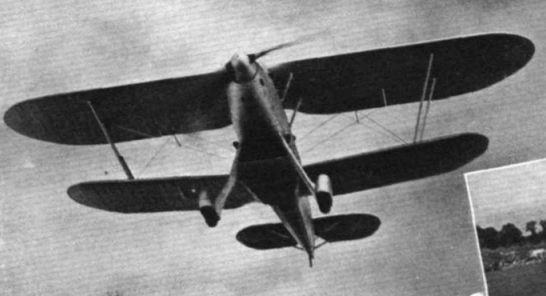 The Burnelli UB-14A, which, fitted with two geared and supercharged Pratt and Whitney Hornets, is said to have a performance equal to, if not better than, that of more conventional monoplane transports with similar power. 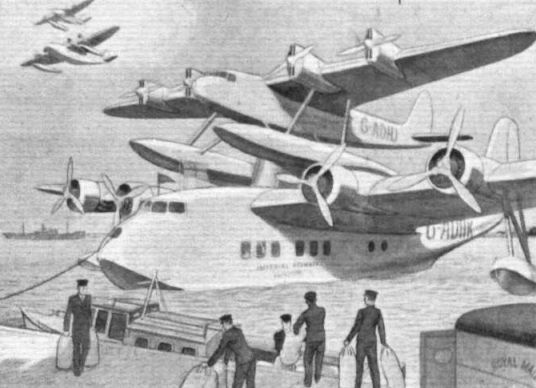 Fourteen passengers are carried and there is ample baggage accommodation in the wings and fuselage. 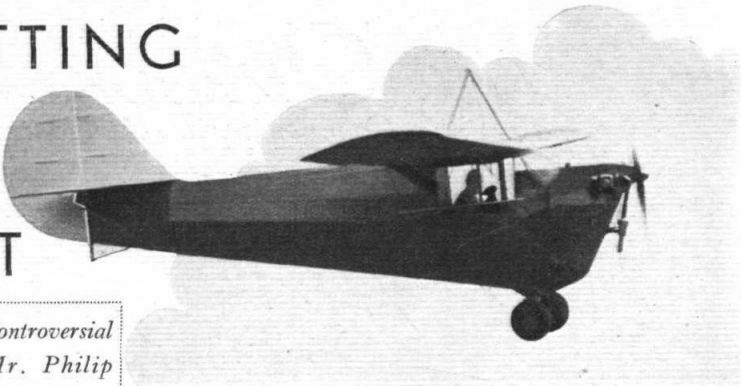 This is the machine in which Clyde Pangbourne once intended to fly non-stop round the world. 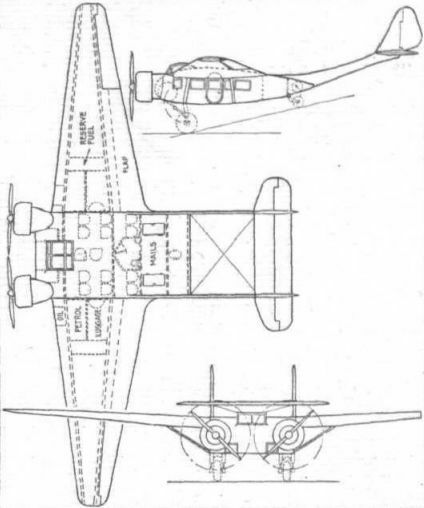 These general arrangement drawings of the Burnelli UB-14A show also the passenger seating arrangements. 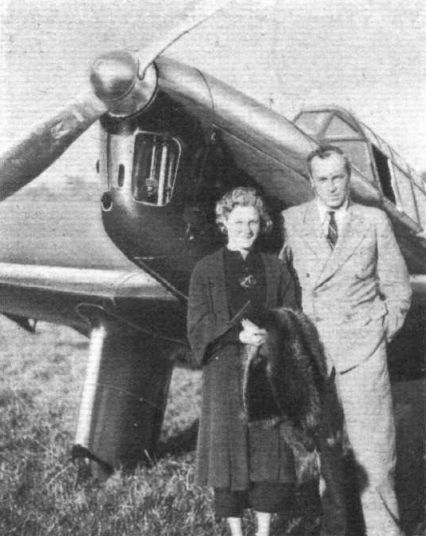 Mr. David Llewellyn, Mrs. Jill Wyndham and the Parnall Heck (200 h.p. Gipsy Six engine) in which they have just beaten the time for the Cape-England journey. It made the trip in 6 days 12 hr. 17 min. OUT OF THE RUT: This is the machine which the Italian Piaggio concern has designed for Transatlantic work. It should cruise, they say, at about 250 m.p.h., and it is intended that the crossing should be made "in stages." There are four liquid-cooled Isotta Fraschinis giving a total maximum power of 3,360 h.p. It appears that the hull is specially designed to facilitate emergency alightings on water. 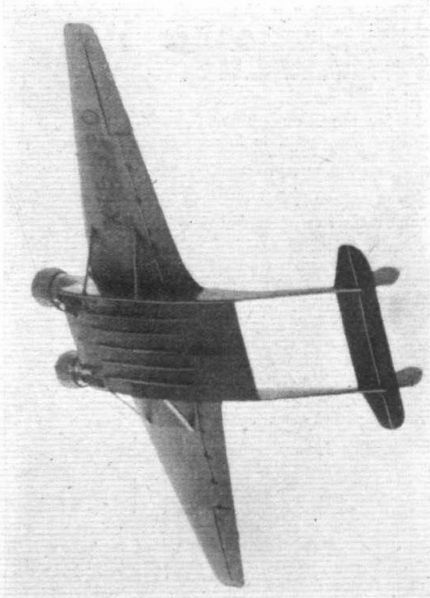 One notable feature not apparent in this view is the negative dihedral angle on the inboard sections of the wings. 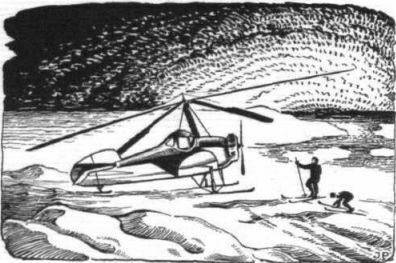 An early Kellett cabin Autogiro, of the type used on the Byrd expedition. "If we are to sit in front of the wing, why not put the engine behind, Drone-fashion?" 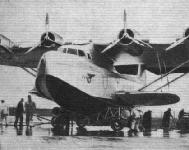 The great Latecoere 521 Lieutenant de Vaisseau Paris, which has six Hispano Suiza Y-class engines giving 880 h.p. apiece. It is said to have reached 158 m.p.h. 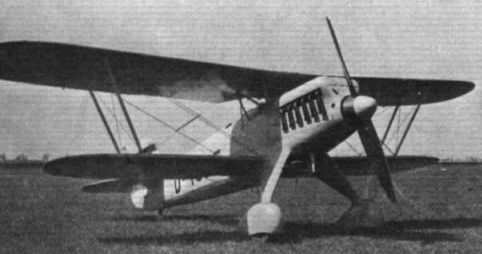 Nieuport Delage 125 C.1 (France). The Seversky amphibian was designed expressly for its job. 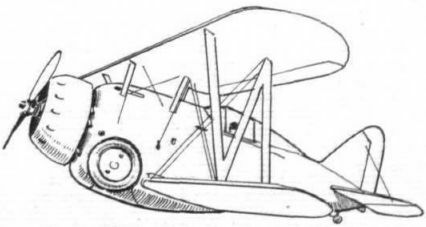 Its wheels are housed in the floats when retracted. 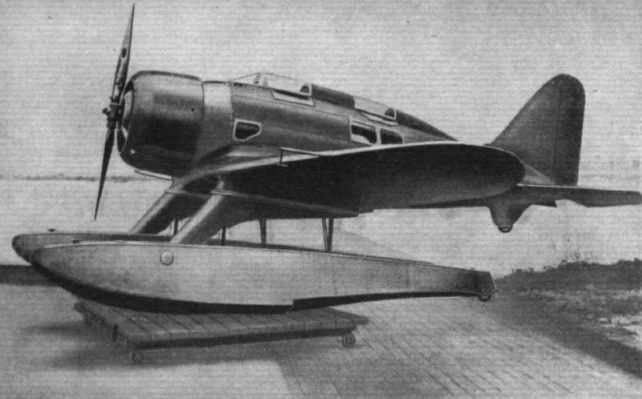 APTLY NAMED: This is the Seversky amphibian which, fitted with a Wright Cyclone nine-cylinder radial of 750 h.p., recently broke the world's speed record for machines in its class with a speed of 230.03 m.p.h. 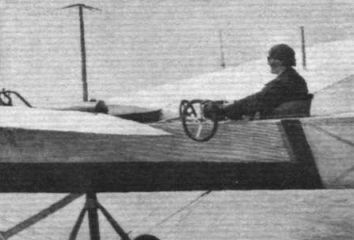 The fastest lap of the course was made at 236 m.p.h. At the controls was the designer of the machine, Major Alexander de Seversky, who is seen in this photograph. He was accompanied on the record flight by his spaniel. WINGED WORDS. The 150 ft. Remembrance appeal which was towed over London by a Lynx-Avro piloted by Mr. F. Gordon Freeman. The letters, which are of fabric, with stiffeners in the leading edges, are mounted on tapes. The sign is laid out on the ground, and the pilot then flies over it, picks it up with a hook, and "peels" it off. Aerial Sites Ltd., of Hanworth and London, were the operators. 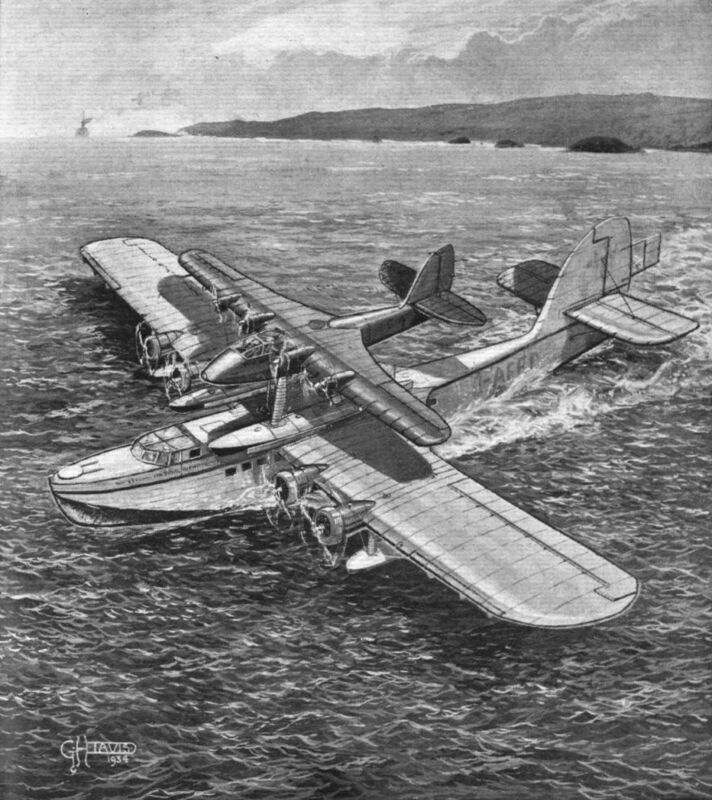 IMPROVING THE BREED: An experimental Stinson, suitable, it would appear, for wealthy private owners in a hurry and for charter work. As will be gathered from an inspection of the picture, stressed metal skin is used. 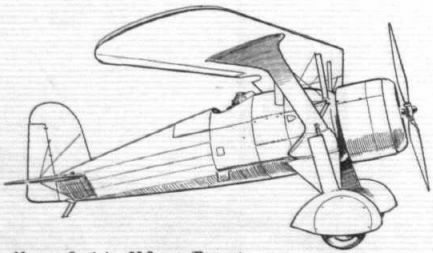 The engine is a Wright Whirlwind. 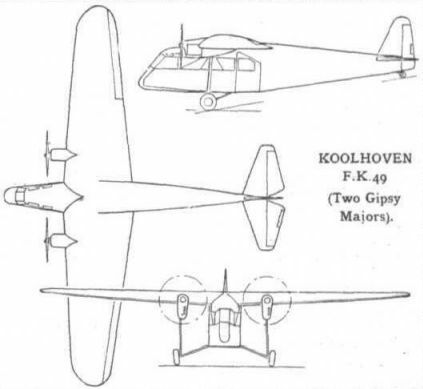 KOOLHOVEN F.K 49 (Two Gipsy Majors).